I finished, with a bit of help from the cheat book and elsewhere. So I immediately started a new game. The ! @#$ furnace room nearly defeated me the first time round and this time it has. I'm using a laptop with a touchpad and this time it's IMPOSSIBLE to get the robot onto the shelf. It must have been sheer luck the first time. Moving the cursor and then clicking is really hard in the time allowed if you aren't using a mouse. When Machinarium 2 is made, can it be easier for touchpads? With regard to getting onto the left side shelf in the furnace room, we can't find any control button on our PS3 controller that will release the robot from the carrier and toss him onto the shelf. The HELP tab doesn't indicate which button that might be, and we have painstakingly tried everything. We're stuck and our robot is getting burned up! With regard to getting onto the left side shelf in the furnace room, we can't find any control button on our PS3 controller that will release the robot from the carrier and toss him onto the shelf. I don't know about playing on a PS3 ~ nor with a touchpad ~ but I just ran through the furnace room level on my PC to see how the interface with the "platform jump" works. After Josef was pulled up by the clamp I had to position my mouse pointer right ON him to make the "left arrow" appear... clicked and he made the leap. Hope this helps both Flobster and you, Zeugitai. Similar experience on a touchpad Laptop and that exact spot is a tricky one. 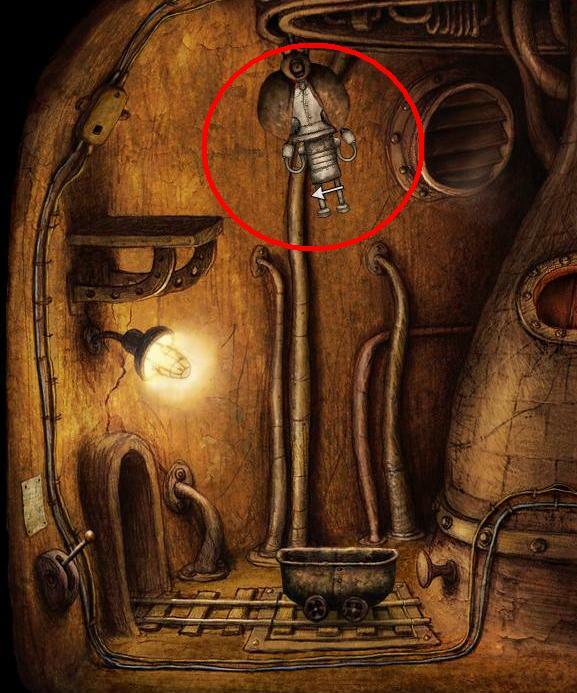 I've had problems with other Machinarium style puzzle games as well (I really should get myself a computer). I followed a guide a few months back to get past it and the instructions were very much in line with what Alex recommended so take the time to repeat the process as described, worked no problem for me in the past.